NOTE: For detailed information about the game, please consult the How It Works section. Your question may be answered there if it is not addresses in this F.A.Q. 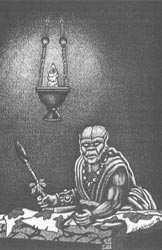 What role playing system is used for Shagrat's Lair? What if I've never played Rolemaster? Why should I play this game as opposed to all the other role playing games on the Internet? Do I have to be an Orc? Do I have to be a Fighter of some type? Do I get to pick my statistics? How does the game run? What if I want to have a private dialogue with another player? Why can't I just email another player? Why won't you tell me how many hit points I have? Because of realism and flexibility, the Rolemaster system developed by Iron Crown Enterprises is used. However, this system should be thought of as the game's "engine." Players will not have to interact with the system at all, as game mechanics will be handled behind the scenes. Don't worry. Because the actual game mechanics are handled behind the scenes, the players do not have to worry about rules of any sort. They are free to focus on playing their characters well instead of having to worry about percentages, levels, and the like. There are many great role playing games available on the Internet. Shagrat's Lair tries to be unique in that the characters are all Orcs, characters are created by briefly role playing through their childhood experiences, and all game information is given in terms of descriptions rather than numbers, e.g. you are not hit for 4 points of damage, you receive a shallow cut on your shoulder. This "experiment" if you will is not for everybody. Many probably do not enjoy not having absolute control over every aspect of their characters' development and/or not thinking about their characters in terms of numbers and percentages. However, for those who think such a thing would be challenging and fun, Shagrat's Lair will be a refreshing change. Yes. However, there are five different breeds with their own strengths, weaknesses, and personalities. Plus, there are a wide variety of jobs and skills. Even two Common Orc Fighters can be radically different characters. There is enough individuation for any player to develop the sort of character he or she desires. Many Orcs are commonly Fighters of some variety, and they're pretty good at it. However, there are no limits per se on what character class an Orc can be, although some will be easier to acquire than others. As your character emerges from adolescence, the key question is: what do you want to be and what challenges are you willing to overcome to get there? No. In the words of Robbie Roberston, "You gotta play the hand that's dealt ya." We recognize that this aspect will probably turn most prospective players away, as many role players like to dictate everything about their character. This is understandable. However, Shagrat's Lair is an experiment in role playing what it might be like to be born, live, and die as an Orc. It is not lifelike to decide if you want to be strong or smart. It is not lifelike to decide that your father is Captain of the Guard and has trained you in combat since you were three. It is lifelike, and much more rewarding, to start out with factors that you cannot control and shape your own future anyway, regardless of the challenges. An Orc that is born very intelligent but not very strong can either harness that intellect and pursue the magical or scholarly arts, or he can decide he wants to be a Warrior and overcome the natural obstacles in his way by extra-hard training. In short, the Game Master will post an update on the Player's Forum every few days, and players will post their responses, including dialogue. An archive of events will be kept in The Story So Far. Email what you want to say to the GM along with your plan for having a private conversation. Do you pull the person aside? Do you talk to them during their watch when everyone else is asleep? The GM will work it into the game. Well, first off, some folks may not want to give their email address out, but might feel pressured into doing so if people are asking for it. The main reason, though, is realism. Using email, players can have lengthy discussions on tactics during combat or plot their treachery against the rest of the party in the middle of a group march. This is simply not realistic. If you have a whispered conversation with someone else in a group, people are going to notice. Players need to think about how they are going to have a secret conversation. By the same token, you just can't stand around and discuss your tactics in the middle of combat. It is true, there is nothing we can do to stop you from emailing other players to have secret dialogues, but we respectfully ask that this not be done as it undermines the spirit of the game. If you want to plot against the rest of the party without their knowledge, figure out a way to do it in secret in the game, and email it to the GM. Of course, anything you want to say publicly, just post on the forum. As you probably know by now if you've read the rest of the material, a hallmark of Shagrat's Lair is that you know just as much about your character as your character would know. In life, people do not know if they have a strength of 75. People can get some measure of their strength by lifting weights, etc., but even that is not an exact measure. For the most part, people only know how their attributes compare to the attributes of others. People know if they are very weak, very strong, somewhere in the middle, or somewhat above or below average. This is largely how information about your character will be given to you. Granted, it is imprecise, but, then again, so is our self-knowledge. This allows for some real role playing instead of just making decisions based on mathematics. For instance, have you ever met somebody who couldn't sing, but somebody told them once that they could, so they sing whenever they get the chance? In the same way, a player who swings a sword for the first time and scores an excellent hit may think they are really good with a sword when, in actuality, they just got a lucky hit first time out. By contrast, a player who knew in numerical terms what his skill was with a sword and what his chance to hit was would always make mathematically accurate decisions all the time. It is these imprecisions, best guesses, and quest to find out more about ourselves that make role playing lifelike as opposed to just being a calculated risk. If such a setup makes you uncomfortable, perhaps Shagrat's Lair is not for you, which is just fine. However, we think that if all this sounds interesting to you, you will find this a very interesting experience, and you will find yourself thinking about your character and taking action using thought processes much closer to actual thought processes. If you're ready to take the plunge, simply send me an email. In this email, you may specify your name, race, and gender. If you really want to get the fullest realism, you may simply send an email saying that you want to play, and the above factors will be determined for you. Or, you may want to specify some of the factors but leave others to "chance." You will be neither penalized nor rewarded for how you decide to handle it; it's just a matter of how much control you're willing to trade for realism. Any way you decide to slice it is fine with us. If, after reading through the material on the site, you still have questions, feel free to email them to me.